The British are known for their love of tea. But, while the UK consumes large quantities of tea, some of the best tasting tea can actually be found in France. More specifically, in Paris at the Angelina Tearoom. 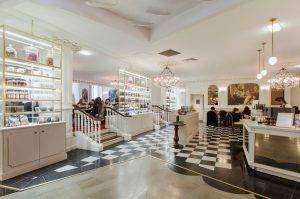 The Angelina Tearoom boasts a small but well curated selection of teas. While they also offer excellent brews of the typical options like Earl Grey and Darjeeling, their exclusive flavors rival some of the best teas in the world. The most popular of which is the Thé Mont-Blanc. Inspired by their signature pastry carrying the same name, this chestnut-flavored beverage is made of black tea sourced from Sri Lanka and China. It has sweet, nutty notes from candied chestnut, maple syrup, and toffee caramel. Add to that the light, fruity scents of papaya, apple, candied apricot, and orange blossom and you have the unique, delightful brew that is the Mont-Blanc. Another excellent choice is the Thé Mélange Angelina which is made of Oolong sourced from China. Angelina describes this as “harmonious, balanced, and tasteful” which is a very accurate description. The Oolong is enhanced by the exotic fruit flavors of apricot and mango and has hints of sweet orange and pineapple. Floral notes from marigold and safflower round out the taste and complete one of Angelina Tearoom’s bestselling brews. The Angelina Tea House also offers some terrific herbal infusions like the Lime Blossom & Mint and the Honey, Ginger, Lemon, and Orange. All of which are excellent choices especially for afternoon tea when they can be enjoyed with a selection of canapés and mini pastries.